Our automatic Beer and Cider Pasteurizer is designed for pasteurizing or heating, holding and cooling of carbonated or uncarbonated beer or cider. The process is used to stop fermentation and stabilize the product before bottling. The outgoing product runs through a heat exchanger and cools itself down, while pre-heating incoming product. A third heat exchanger with a chiller can be added to further cool the product. In the first stage, the beer or cider is pumped through a plated heat exchanger, where it gets pre-heated by the outgoing hot product. In the second stage, the heating system provides the required heat to bring the product to the desired temperature. In a holding line the product is held at temperature for the required time. After exiting the holding line, the juice flows out of the pasteurizer via the first stage where it is cooled down by the incoming juice. Upon request, we can add a third heat exchanger, where the beer or cider is further cooled through a chiller. The heating medium is diesel, propane/natural gas, hot water or steam. The pasteurizer is delivered “ready to operate”. Before operation the machine has to be connected to the heating medium and the exhaust system. After making a connection to the product reservoir and to the filling device you have to fill water into the heating cycle. Now the Pasteurizer is ready to operate. 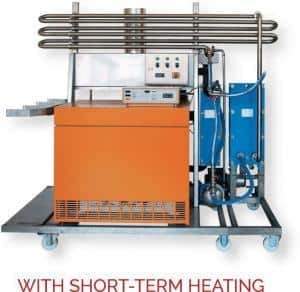 Temporary heating and Electric pasteurizers are also available.